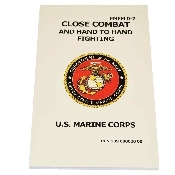 This is the United States Guidebook that teaches our soldiers the methodology and techniques of the Marine Corps System of Close Combat (MCSOCC). MCSOCC uses a proven system to teach marines the techniques necessary to defeat an opponent in close combat. Topics Include: Fundamental of Offense/Defense, LINE System, Bayonet Fighting, Weapons of Opportunity, and much more.